As a SaaS business matures, the importance and value of SaaS metrics increase. Most SaaS businesses begin their journey down the SaaS metrics path by tracking recurring revenue in relation to customer acquisition costs. After building a solid customer base, churn becomes a priority. These fundamental SaaS metrics are all apparent in the standard SaaS profit equation below. However, it quickly becomes apparent that fighting churn requires a SaaS metrics toolkit that digs significantly deeper than simple financial metrics. Operational metrics are needed that connect day-to-day business reality to financial performance. It is this realization that gives birth to the new Metrics-driven SaaS Business as it discovers the goldmine of SaaS customer success metrics and predictive analytics that enable it to eliminate churn before it begins. But what about the other half of the profit equation? Is it possible to apply SaaS customer success metrics to customer acquisition? The answer is most emphatically yes! Prospects are merely future customers, and their success lies in the purchase of your SaaS product. It’s a SaaS best practice to provide a seamless customer experience from visiting your website to trial to purchase to use, therefore the metrics used to describe this process should be seamless as well. In all cases, the goal is to help customers become happy users of your SaaS product, i.e., successful customers. SaaS customer acquisition is merely SaaS prospect success. because prospects are merely future customers whose success lies in purchase. This is the third post in a series inspired by my ongoing collaboration with Bluenose Analytics that explores the new Metrics-driven SaaS Business based on emerging best practices in SaaS customer success metrics. The last post discussed the promise of SaaS customer success metrics for churn reduction and upselling. This third post examines their use in SaaS customer acquisition. Marketing automation vendors built an entirely new software category based on the idea of facilitating purchase by helping B2B companies engage more effectively online with the New Breed of B2B Buyer. Unfortunately, marketing automation products focus all their attention on trying to get prospects to read your content, not use your product. Reading content is good, using product is better. Online trial is a foundational SaaS best practice and improving trial conversion is strategically important to many SaaS vendors. 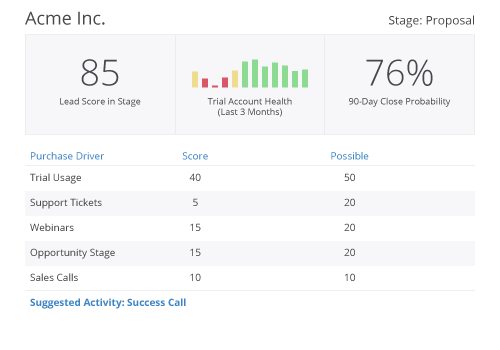 Fortunately, SaaS customer success metrics offer as much potential to increase trial conversion as they do to reduce churn. 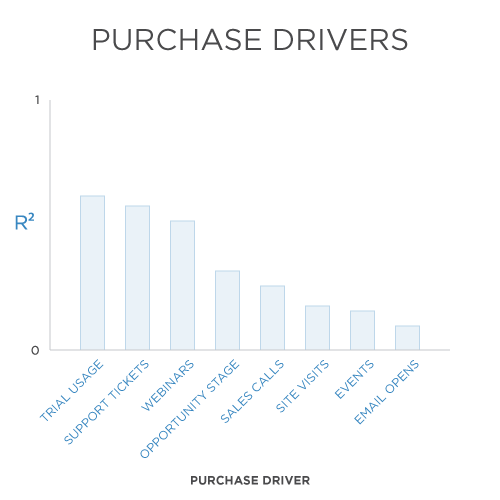 only we are looking for drivers of purchase rather than drivers of churn. Trial is the moment where the SaaS vendor establishes that always-on communication channel to the SaaS customer through the product. Prior to trial login, customers are just cookies and email addresses. After trial login, product usage can be monitored and every click can be associated with an individual customer. Trial forms also collect key customer demographics that can be used in predictive models. In fact, The Metrics-driven SaaS Business uses these same models to decide exactly what questions should be asked on a trial form, i.e., the ones that can be used to best predict and facilitate purchase! Using SaaS product usage data to create predictive purchase models is SaaS lead scoring done right. Moving along our SaaS profit equation, we come to one of the most important SaaS financial metrics for every SaaS vendor: customer acquisition cost. Keeping customer acquisition cost is line is essential to the financial success of every SaaS business, because customer acquisition eats cash. The lower your customer acquisition cost, the sooner you get repaid for your upfront investment in acquiring a customer, and the sooner you can reinvest that money in acquiring yet another one. By now you should be able to guess exactly how SaaS customer success metrics can be applied to reduce customer acquisition costs, because they are essentially similar to the methods for improving customer success efficiency. First we need to identify the key predictors of purchase. For example, our analysis of product usage data may indicate that prospects that use the product every day of the free trial can usually be converted with a single phone call, whereas those that stop using it within the first week are twice as likely to convert if we can get them to attend an instructional webinar. Now what SaaS account manager wouldn’t love to have that little jewel of information? As with our customer success organization, the key to reducing acquisition costs is to embed our predictive models into the daily sales activities. The process is the same. First we create descriptive models to identify the root causes of why prospects do and don’t purchase our product. Then, we use these models to create KPIs at the trial account level that reps can use to guide their daily activities. We can also create alerts when specific trigger events require a reps attention, such as increased or decreased product use of a particular kind. And, finally, we can automate communications within the product itself to facilitate purchase. Onboarding a new customer is where customer acquisition and customer success meet. Most SaaS customer success professionals will tell you that inadequate onboarding at the beginning of a contract is one of the key drivers of churn at the end of the contract. In addition, onboarding can be an expensive and time-consuming task for more complex SaaS products. The Metrics-driven SaaS Business understands the strategic impact of onboarding and applies SaaS customer success metrics to streamline the onboarding process and reduce onboarding costs. Where are your new customers getting stuck? This is the primary question of the onboarding challenge, and I can think of no better indicator than product usage data. Whereas acquisition and churn KPIs were largely focused on predicting future events, onboarding customer success metrics are looking at the here and now, as in “Why is this customer stuck right here, right now?” By drilling down on this question, we can identify root causes and predictive indicators of onboarding failure that can be used by both customer success reps and product managers to streamline the onboarding process. At the beginning of the SaaS customer lifecycle, SaaS customer acquisition and SaaS customer success first meet in onboarding, but at the end they meet again in viral growth, where life begins anew. Up until now, we’ve explored a number of ways SaaS customer success metrics can be applied to eliminate problems: stopping churn, reducing service costs, improving trial conversions, etc. At the top of the capability pyramid, The Metrics-driven SaaS Business uses SaaS customer success metrics to create opportunities, not just resolve problems. The same techniques we used to identify customers who might churn can be used to identify customers that will never churn, customers that love us, and customers that will recommend us! By applying SaaS customer success metrics to identify advocates, we can improve our bank of potential sales references, customer testimonials, case studies and user group leaders. Many organizations use methods like Net Promoter to measure customer advocacy, and these are good ideas for SaaS businesses as well, but only SaaS businesses can complement these qualitative measures with quantitative customer advocacy metrics based on actual product use. case studies and user group leaders. 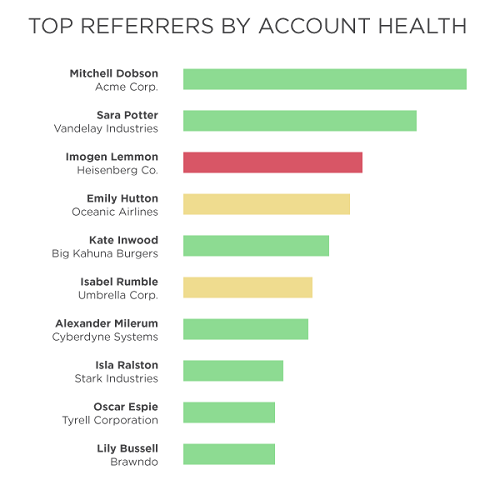 Enabling viral growth through sharing is a common SaaS product design best practice. The main idea is to encourage customers to create work products, such as documents, charts, projects, etc. that are integral to the SaaS product experience, and then share those work products with non-customers with whom they need to collaborate. Understanding and facilitating the activities that lead to sharing is strategic goal of the Metrics-driven SaaS Business, because viral sharing leads to viral revenue growth. This article was originally posted on ChaoticFlow.